I would go to the Brigham's Ice Cream factory and sample every single flavor made fresh that day. It may seem silly, but this is my favorite ice cream brand because I grew upon it. My favorite memories spent with my Nana were shared over a bowl (or two) of Brigham's chocolate chip. When something calls for a celebration in my family, we don't reach for the champagne, but for the Brigham's in our freezer. "Boston Native Wins Miss USA". There are so many causes near and dear to my heart, that I could not pick just one for a headline. Although as Miss USA, I would have a global influence on improving and raising awareness for these specific issues. My voice would be amplified and more powerful than ever before. Advocating for classroom inclusion, social media safety and awareness, as well as funding for breast and ovarian cancer, are all at the top of my list. My dream home is in front of the camera. I live there in my dreams right now, but it will be a reality in my future. I don't care where I sleep at night, as long as I get to be the one delivering the news to a large audience. A place that you live in is all materialistic. I don't care where I physically live, as long as I get to be in front of a camera, have supportive family and friends, and are happy. Rose, after my grandmother. I'm obsessed with the scent of roses, and my home is filled with Rose candles. I will buy any beauty product if it smells like roses. Dior has a lip balm I habitually buy solely because of the way it smells! Nicknamed, "Queen of the Garden," it's pretty fitting for a pageant girl like myself! 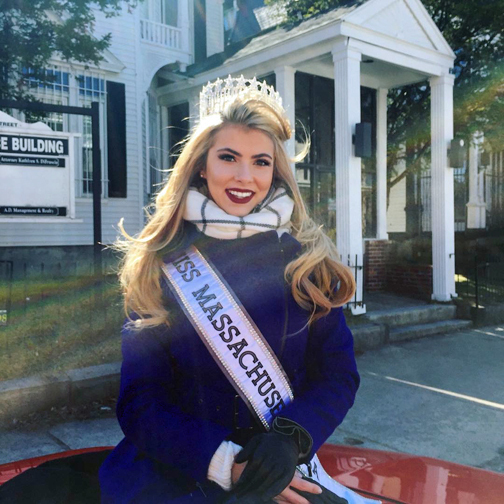 As Miss Massachusetts USA, I'm so fortunate to have had so many opportunities to speak in front of crowds. The best public speaking advice I have ever been given is to know your audience. Something incredibly important to me is teaching young kids social media safety. When I get to speak to a classroom, the first thing I open up with is, "Who has an Instagram?". It catches their attention and makes the kids a little embarrassed and giddy! It perfectly sets up my talk about Internet safety. After that I will introduce myself. I'm so grateful to live in a country where as I citizen, I have a right to vote. This is my first presidential election that I am age eligible to vote, so it is especially exciting for me! There are qualities in every presidential candidate that I like, but I also disagree with at least one issue as well. Right now, I am undecided because I need to make sure that the vote I am casting is the right decision. I can't urge Americans enough to please do your research on every candidate. Your vote does count! I wish I could make everyone happy, but I understand that is impossible in life. I'm a people pleaser and problem solver, so I wish I was better at being accepting the fact that I'm not Wonder Woman! Everyone has their differences, and that's part of the beautiful thing that makes people unique. This is a work in progress for me, but I'm getting better at it! I live in the best state because regardless of the season, there is always something to do! In the summer, my friends and I have a tradition that every Monday we go to Good Harbor Beach in Gloucester from early morning to sun down. Some of my favorite memories are on that beach! In the fall I always get in a crafty spirit, constantly sewing or making something. There's nothing better than sitting in front of a fireplace with my creative mind flowing. Winters are spent on the slopes, freezing, but having a blast skiing with friends and family. Spring is my favorite time to get posts in for my fashion blog because the flowers are blooming. If I could say one thing to the world, it would be a message conveying the importance of being smart over the Internet. Unfortunately, I was a victim of a cyber crime out of my own ignorance of social media safety. It's my mission to teach children while they are still impressionable how imperative it is to be proactive and smart when it comes to the Internet. I am incredibly active when it comes to my job of being Miss Massachusetts USA. In just four short months of winning this title, I have made over 35 charitable appearances and I'm not stopping there. I recognize that I only have one year, and I am making every day count. As Miss USA, my active lifestyle would be a positive addition to the organization. Not only would I be beneficial to the organization, my philanthropic nature would make a profound difference for causes that I am passionate about in this country. If crowned Miss USA 2016, more lives would change than just my own. We wish Whitney the best of luck at Miss USA 2016!